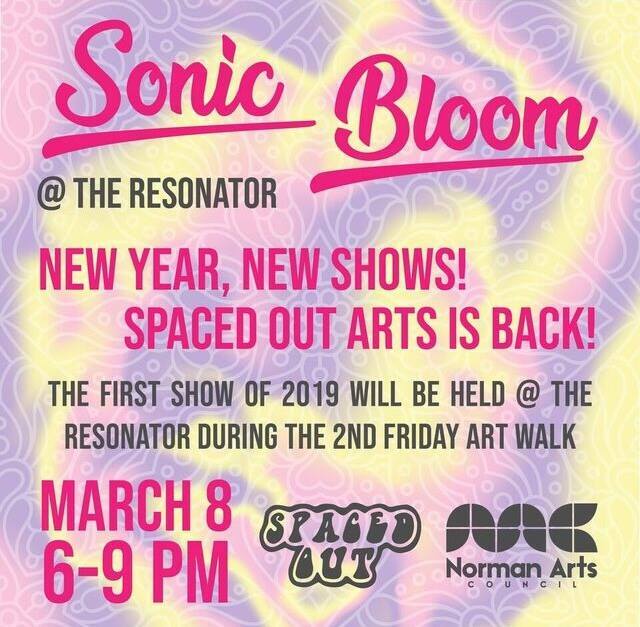 “Sonic Bloom,” organized by Spaced Out Norman, will be shown at Resonator on March 8th during the 2nd Friday Art Walk. It will feature some incredibly unique and talented local artists and bands to kick off Spaced Out’s 2019. Q: How did Spaced Out really start and form as a group or operation? A: It was kind of an evolution. It initially started from an entrepreneurship, like art and business class I took at OU. Jonathon Hils taught it along with a business professor, and I took it with a few friends like Reva and Rebecca were in it. And so doing an art event, it was an art and music event but the art event is really where Spaced Out came from. We had some local artists set up on Campus Corner and then after that class we saw potential in that part of the project. And so me and Reva and Rachel Stout over the summer kept it going and had several of them happen, we’ve had like four of them happen I think since that class. And now we’re just evolving Spaced Out into different kind of art events besides art crawls on campus. Q: How would you describe Spaced Out to someone who isn’t a part of the art community and might be interested in attending? A: What me and Rachel are trying to do with Spaced Out is start a platform for local artists of any medium or background, whatever they’re doing to feel welcome and have a space that’s welcoming for what they’re doing. I remember when I was trying to get out there a few years ago I needed that space too, I needed people to help me get out there and enter shows that didn’t feel like giant obstacles or mountains to climb to be a part of. Q: Has your personal aesthetic gone into any of the branding or concepts behind Spaced Out? A: Yes! You know I’m really into aliens, I really injected it into that art and business class, but it was shared amongst others too, and I think now that me and Rachel have really taken this on I think our styles work pretty well, kind of funky and sort of spacey and trippy in itself, so of course I’d like to inject a little bit of it into that, or a lot of it into it. Q: What can we expect from the Sonic Bloom show on March 8? A: We’re gonna have a lot of dope local art, a bunch of different mediums it looks like from what we have so far, a lot of dancing, a lot of jams, snacks, good times, and hopefully some really cool exposure for artists people haven’t seen before. Q: What compelled you or motivated you to put Sonic Bloom together? A: Just the want to have it in a space, like in a physical building or space. Kind of like us, Resonator is also up and coming, I love what Resonator does and me and Rachel are both connected with it in different ways, like the people that run this place, and so we want to just integrate it and maybe move away from Spaced Out on campus and try to bring it to different venues. We also want to support those venues, kind of like a symbiotic thing. Q: How would you say it’s different from other shows? A: Not to say other shows aren’t, but we’re completely open, we’re literally just like, “do you wanna show your art?” “Yes.” It’s really just about bringing people in, like I said anyone from any level or any background, you know whether people know you or not like to seek them out and put them out there. Q: What would you like Spaced Out to focus on moving forward? Are you planning any other exhibitions? A: We are definitely wanting to do more things, we haven’t set anything in stone but this is definitely not gonna be the last thing. We talked about getting more involved with or partnering with other charities or a women’s resource center show or just things to help benefit the community more, that’s where our hearts are at too. Q: Your artwork is incredibly unique and I can always pick it out from others, what inspired you personally to create your work in the way you do? A: I don’t know, just kind of like a medley of stuff. I can kind of think back to when I was 15 when all of the space grunge stuff was really happening it seemed like and just the cutesy, creepy kind of Japanese aesthetic, like all the eyeballs and the combo of cute crochet flowers and creepy eyeballs, like that juxtaposition has always been a thing I really enjoyed. And different crochet artists like Olek (Agata Oleksiak) or Kelly Limerick really inspired me and I just kinda want it to be like a funky mix. Q: I read that you’re an apprentice tattooer at Hall of Tattoos and from what I’ve seen your style is really graphic and seems to translate really well across different mediums. Is there anything you’d like to share about your creative process or any advice for newer artists? A: Well, for me it wasn’t necessarily too long ago that I was pretty much kind of like a hermit artist, I just made a lot of stuff and spent a lot of time creating art but didn’t have the confidence to really put myself out there. I just didn’t know if I had what it takes and then I had a really good friend of mine who invited me to go table at Art Walk and honestly just from that one night I was inspired to do more and more because I realized this is how you’re going to progress, this is how you’re going to learn is by getting exposure by putting yourself in a position where you are around other artists, other like-minded individuals who are going to support you in what you do, but then also kind of taking feedback from the public. Now at the end of the day it’s very important to stay true to your art and everything and to create for you and to create what, you know, you’re inspired to create but I think that going out there and kind of taking these opportunities that maybe you don’t feel ready for is what’s going to prepare you for those opportunities in the future. For me, my process has always been I’m kind of the type of person who has the tendency to go out there and try to tackle something even if it does cause anxiety, even if it does put me in a position where occasionally it seems too hard or too big for me to actually do and, especially in the tattoo field, learning how to tattoo has been extremely emotional, extremely challenging, and you know I wouldn’t tell anyone who wants to go into it that it’s easy. It’s extremely emotionally trivial especially being a female tattooist in an extremely male dominated industry, but as far as my art goes it’s a very free world for me and I want every artist, every young artist, to know their value with what they create and I know that you create for you but the world wants to see what you create. I thoroughly believe that a lot of art is meant to be seen and it’s all up to the individual on when they’re ready and what they show, but I think that if you’re a creative it’s definitely a gift to the world to share what it is you do, what you create. That’s kind of what Spaced Out is for, it’s to give these artists an opportunity, a platform that’s very, very accepting of whatever it is you do to be able to have a chance to show their art and maybe have that boost that I had with the 2nd Friday Art Walk to start aiming higher, doing more things, getting involved with their local art community or maybe even just supporting other artists the way they’ve been supported. Q: So would you say your personal experiences as an artist have influenced how you kind of run or organize how Spaced Out operates? A: Oh definitely because, you know, for me and, I don’t want to speak for Kelley, but I feel like in a lot of ways finding art opportunities is kind of a challenge and especially when you look at an application they’re looking for an artist bio, statement, your resume, that’s extremely intimidating to a new artist and at times I look at it and wonder where the opportunity is so they can have stuff on their resume. For me that’s what I ran into, I’d find opportunities that were very accommodating to emerging artists but then I also realized that was harder to do than finding shows that were for more established artists. So Spaced Out is kind of to fill in just a little bit of that whole so that artists can find that opportunity and they don’t have to be nearly as intimidated by the application, by not being accepted into the show, knowing that they will pretty much be guaranteed an opportunity to showcase their work in not only an accepting environment but we hope is also a fun environment. Q: Do you have plans to potentially expand Spaced Out to help other artists in building their resume or are you wanting to maybe stick to the exhibition side and provide more opportunities? A: As of right now we’re sticking on the exhibition side, I would love to as even I gain experience begin to help artists more and more with that end because this is all a learning experience for Kelley and I too so learning how to kind of curate and put together exhibitions and work with other artists as the people putting their art on display that’s kind of flipping the script a little bit for us so right now just putting together the exhibitions and doing that is probably what we’re going to stick with for awhile and definitely in the future I could see that become something that we’re far more qualified to help artists with. Q: Kelley told me that this all started from an art and business class taken at OU, how was that experience for you personally? A: Well, I wasn’t a part of the class, I’m not a student, so I was invited by Kelley and her classmates to set up for that first show and I don’t remember quite how it began but I know that at one point it came up that we’d want to continue this and want to try and continue to expand this and I wanted to help and over time became more committed to the project and now that Reva, who was a part of establishing this as well, is no longer here it’s just Kelley and I and having that third party helped quite a bit and I definitely am very excited to be a part of the project, especially since I wasn’t a student at OU. Q: Do you feel like your personal aesthetic has kind of helped and are integrated with the branding and concepts behind Spaced Out? Kelley mentioned your styles seem to compliment/work well with each other, do you think that complimentary nature also helped contribute to the success of Spaced Out? A: I think Kelley and I’s art are very different, I use lots of black and white and she does a lot of color, her work is very three-dimensional and mine is strictly two-dimensional artwork and I do think in a lot of ways just because our mindsets on how we create are different they compliment each other and whenever we’re working together or put a show like Sonic Bloom together our ideas have kind of come together to help with the actual arrangement of this. But as far as how it’s helped Spaced Out grow I’d say it’s probably just no more than any two other individuals who are committed to a project or know what they’re doing and can share similar values on art and artists and the art world in general. Q: What was the process behind developing Sonic Bloom? A: Whenever we were doing shows on Campus Corner we knew that we weren’t going to want to try to continue those in the winter as it got colder and everything and we decided we maybe wanted to shift our gears a little bit with how we’re operating and we decided that we wanted to not just be completely silent all winter so instead of having a bunch of little events we decided to have one big event. We have support from Resonator, Kelley and I have been involved with Resonator in the past so they’ve provided the venue and we’re just putting it together and I think that because we had experimented with the Campus Corner shows and everything it helped us learn more about how we want to operate as a group.